A big thank you to Owen Kimber for this write up of his OCC adventure. 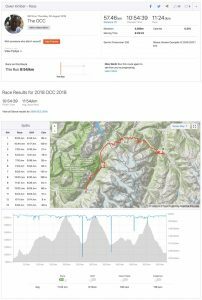 When it was suggested that I write a “race” report after completing the OCC at the end of August, my initial reaction is that it wasn’t really a “race” for me – I didn’t have a time target, I didn’t have a placing target and I didn’t run the whole way – it was more of a journey where I am delighted to say that I achieved my main aim (to finish). I wasn’t sure about writing this report as it was a very personal journey for me. I am not one of the quicker runners in the club and my weekly mileage is well below others, but I hope I can demonstrate that anything is possible whoever you are. I guess the journey for me started when I was 19 years old (yes – it was last century). Good friends suggested we walk a long-distance route, the Tour du Mont Blanc, which starts and finishes in the Chamonix Valley in the French Alps, circumnavigating the Mont Blanc mountain via Italy and Switzerland on 170 km of trail with 10,000 m of ascent. Being poor students, we wild-camped by streams and carried all our food – taking 10 days to complete. It was an amazing experience that gave me a taster of the high Alps. 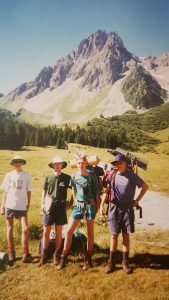 Since then, I have holidayed in the region many times and it was while there 10 years ago that I heard of a running race that loosely follows the Tour du Mont Blanc route – the Ultra Trail du Mont Blanc (UTMB). My initial reaction was that surely it is not humanly possible to run that far on brutally steep mountain paths and the mere mention of those four letters, UTMB, will send a lot of trail runners into a cold sweat. 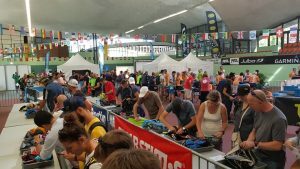 As I got more familiar with the UTMB, I discovered the annual trail running festival attracts attention like no other off-road event in the world. It has spawned 3 additional, shorter races that take-in a portion of the complete circuit. Over 10,000 runners, 50,000 supporters and a whole entourage of outfitters come into Chamonix at the end of August. 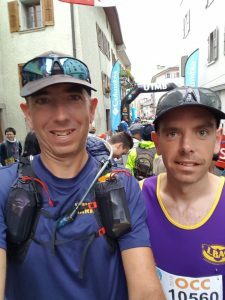 My brother, a much better runner than me, was also attracted towards trail events and it was about two years ago that we first discussed the possibility of seeing if we could have a go at a UTMB event. 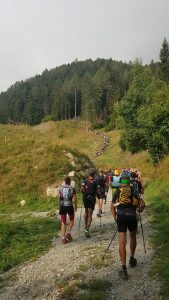 The shortest of the 4 races is the OCC, named because it starts at Orsieres in Switzerland, via Champex in Switzerland to Chamonix in France, covering a distance of 56 km and 3,500 m of ascent – which I estimated to be equivalent to 115 reps on Frith Hill. However, my training wouldn’t be able to replicate the potential heat, cold, altitude, 800m descents, rocky trails and French cheese. To get into any of the UTMB events, you need points from qualifying races. For the OCC, my brother and I achieved the points by completing two events during 2017; the Marathon du Mont Blanc and the Endurance Life Dorset Ultra both had 3 points attached to completion. We entered the draw for the OCC in December, but knew our chances were only 1 in 4 – so it was initially a shock and surprise to learn we had got in. I didn’t necessarily change my training routine, but I did try and run more hills than usual. Although St Martha’s Hill is not Mont Blanc, we are lucky to have some great hilly trails in our area. My main aim was to be physically and mentally strong, fresh and healthy – so I did a lot of cross-training with cycling, gym work, swimming and pilates on top of my couple of runs each week. We arrived in the Chamonix area on August Bank Holiday Monday, before the OCC on the Thursday of that week. Given the higher parts of the OCC exceed 2000m, we felt we needed time to get acclimatised. On the day prior to the event, we had to pass the registration checks in Chamonix. The mandatory kit items covered the spectrum of conditions that you can get in the Alps from snow to baking temperatures. Amongst other things, they checked items like factor 50 suncream, sarahan cap, high-graded waterproofs with taped seams, cup (it is a no-plastic event), survival blanket, international mobile phone and a passport. It was at this point that the scale of the event started sinking in as the kit check was done in a sports centre with airport style security queues, trays and checkers. The nerves kicked up a notch as I really didn’t want to have come all this way to find I wasn’t allowed to start based on a technicality. And, despite experience from other events, I always think I am misplaced in a gathering of amazingly fit looking people who are covering themselves with all the top gear brands – was I the only one who wasn’t kitted by Salomon, Columbia, Ultimate Direction etc, instead opting for Kalenji (available from a well-known outlet in Guildford)? Having thankfully received our race chips and numbers, we spent a few hours around the event expo and Chamonix. The place was alive and buzzing with trail running geeks and a really friendly carnival atmosphere had taken over the town. It took self-discipline to not buy a load of kit – although a €79 price tag for the standard Salomon technical t-shirt was off-putting. Race day started with an alarm at 4 am (although I was obviously well awake with nerves before this) ready for our 5 am bus transfer to the start at Orsieres, Switzerland. It seemed that most of our fellow runners were relaxed and asleep for the 90-minute bus journey; I was focusing on watching the high mountain hairpin road corners and trying not to think of the closing scenes from The Italian Job. After a light breakfast, we threaded our way through the narrow streets of the traditional Alpine village to the main square with the start banner and wished each other the best – I was not going to follow my brother’s elbows to the front of the pack and knew that I wouldn’t see him again until Chamonix. A mixture of emotions ran through me at this time; relief that I was here and there were no more logistical hoops to overcome, terror from looking at my fellow runners and thinking that I was way out of my depth and excitement at the sheer buzz of the event with the loud Vangelis music (the soundtrack of all UTMB events) pumping across the square. Finally, 7 am arrived with a count down, the pack surged forward, and I was quickly running across the start line to shouts of allez, allez and cow bells from spectators. 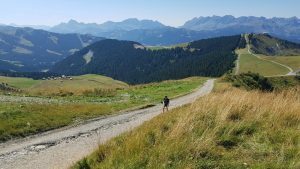 As road turned into trackway leaving Orsieres, I settled quickly into an easy rhythm, breathing comfortably, enjoying the fresh early morning in the mountains and found myself smiling and joking with other runners. The first climb quickly turned into the first descent and, in what felt like no time at all, I was a few kilometres into the route, relaxed and thoroughly enjoying myself. After passing through a couple of picture-postcard small villages which were decked in bunting for the occasion with local school children being excused from lessons and more of the now-familiar allez-allez and cow bells support, I reached the first big climb at the 6 km point to lead up to Champex-Lac. I ought to comment on my irrational dislike of running poles. It seemed that 80% of other participants were using them to help propel themselves uphill and they are the subject of much debate in forums. If you can imagine steep mountain trails that are packed with runners, there is not a great deal of space for passing – pole carriers need much more space and I am sure some were using them as weapons to defend their position. I passed through the checkpoint at Champex-Lac feeling comfortable and continued climbing. At the 20 km point, the route climbed above 2000 m and the sun started breaking through. There were stunning views through gaps in the clouds below into the Sion valley some 1500 m lower. Maybe it is my long legs, or maybe it is the Frith Hill reps in the winter, but I seemed to be going faster than people around me, so my confidence was high. A word here about the checkpoints which were a highlight. Inside the tented marquees, there were places to rest, fellow runners helping each other and a huge range of food. 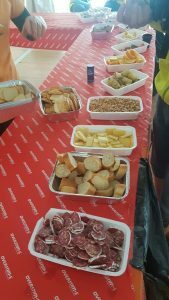 It would have been rude not to have indulged in the strong alpine cheeses and hams on offer and I wanted to enjoy the eating challenge as much as the running challenge. The checkpoints were located in the valley villages where there were high levels of encouraging support with more allez-allez and TV cameras giving live feeds – yes, a few people following online did note they saw me cheerfully waving at each one I passed. The sun was out in the early afternoon, the trail running was stupendous, and I guess I had passed into France as the footpath signposts had changed colour. After crossing the Col des Montets, I was into the Chamonix Valley and onto familiar ground for me. 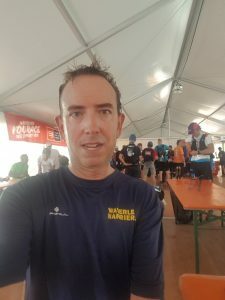 I was feeling really quite tired upon reaching the last main checkpoint in Argentiere at 46kms, but also felt I still had strength in me and a lot of spare time. I made it up the last big climb of 600m to the ski station at La Flegere in one piece and knew I was going to finish the event without needing my head torch. All that remained was a last 900m descent through the forest into Chamonix. That sounds simple, but it was the most deeply unpleasant 6 km I have ever done, and I am surprised I made it down the rocky trail without a fall. The descent finished in the streets of Chamonix where a fenced off pathway took me quickly into the town centre. To do these events, I find I need to be not just physically strong, but also mentally very focused in both the lead-up and during the event. Those final steps into Chamonix were a chance to look back on the months of build-up and dreams of this moment as well as the journey that day. What I wasn’t expecting was the welcome. I assumed that I would find the finish line area deserted, but for the last few hundred metres, I was being cheered with the allez-allez shouts, cow bells and people banging the advertising hoardings like I had won the event. I checked over my shoulder thinking that someone well known must be just behind me, but, no, it was just crowds of supportive people selflessly appreciating my efforts (I took some video: https://flic.kr/p/2cQXfKd). It blew me away and reaching the iconic UTMB finishing arch in front of the church in Chamonix was just a massive moment. I am so lucky that this was no longer a dream and it is a privilege to have completed a journey in the mountains like this. For what it was worth, I was the 852nd finisher out of 1572 in a time of 10 hours and 55 minutes. What was more important was finding my brother who had finished hours before me and, as it was my birthday, enjoying a steak and beer. As a postscript, on the day after the OCC, we were back in Chamonix for the evening start of the main UTMB event. The streets were packed with thousands of supporters, and despite the cool, damp weather, the atmosphere was electric as more Vangelis pumped from the speakers. The press was billing the race as the big showdown between the young pretender, Jim Walmsley from the USA (team Hoka) who trots across the Grand Canyon for a morning training run and Kilian Jornet from Catalonia (team Salomon), famous as a 3-time previous winner and for holding the fastest known ascent times on many of the world’s most iconic mountains, including Everest. The starters passed us in a blur, so we drove around to St Gervais at the 20km mark. We got a place next to the checkpoint in time to see Jim Walmsley sprightly bouncing and smiling as he came past – looking like he was a kilometre into a park run. He had a course record time at this point, but the weather conditions in the mountains were not great. Kilian and a few others followed soon after, but we noticed other serious contenders were 20 minutes further back. 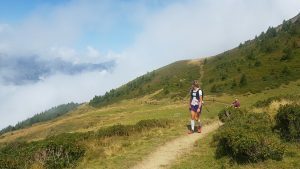 We woke the next morning to find that most of the world’s best trail runners, including Kilian and Jim, had withdrawn overnight in poor conditions and local man, Xavier Thevenard won after completing the 170 kms in an incredible 20 hours 44 minutes. Of the 2500 starters, nearly 600 did not finish. The relatively unknown British runner, Damian Hall, who only took up running at the age of 36 in 2011, came in 5th place. The top-3 female finishers were all in their mid-forties in age. It strikes me that the UTMB is a classic tortoise and hare race, where mental toughness, smart decision making, luck, as well as running speed are required. It was fun following their endeavours on some of the terrain we had crossed and a lesson that the beautiful mountains themselves are the real winners. Really enjoyable and inspirational read – thanks Owen, and congratulations!